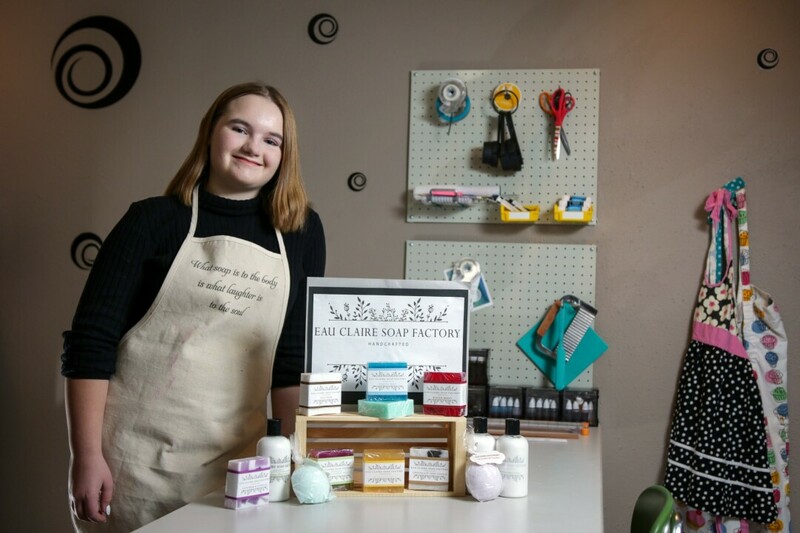 Madeline O’Neill, a 12-year-old Eau Claire entrepreneur, is the founder, owner, and operator of the Eau Claire Soap Factory, which produces and sells handmade soap, shower steamers, and lotion at craft fairs and pop-up events locally and online. Madeline – or Maddy, as she is called by her family – started making soap about two years ago after taking a summer class on soap making. Maddy said she has always taken summer classes at her mother’s encouragement and has learned a variety of skills at the classes, but the soap making class was different. Maddy took the soap making class out of curiosity, hoping for a fun experience, and it turned out to be one of the best decisions she has ever made. After Maddy learned to make soap, her art teacher introduced her to a program called FUSE (Future United States Entrepreneurs), a collaboration between her school and Royal Credit Union. The program is a competitive learning program which gives kids four weeks to develop a business plan and then present them to a panel of judges and an audience for the chance to win a cash prize. Maddy was among the winners of the 2017 FUSE event, where she was recognized for the product appeal of her soaps, shower steamers, and lotions. Maddy’s business has taken off since her participation in the FUSE program. Maddy said her life has changed dramatically in the past two years: Now she balances making soap and running her business in addition to being a middle-schooler. “I started to make soap on my own at my grandparents dinner table, and now I have an entire room at home filled with supplies and dedicated to exploring my creativity with soap, lotions, and shower steamers!” Maddy said. “My business is one of my top priorities, but school is at the top of my list. My school work is not normally a problem because of study hall at the end of the day. That is typically when I finish my homework. But I will say that I’ve had several late nights working on making soap before a presentation or a craft fair.” Maddy also credited her mother, Michelle O’Neill, with her success, noting that her mother has supported her and helped her every step of the way in developing, launching, and running her growing her business. Maddy sells her products 24/7 on eauclairesoapfactory.com, and has also sold them at a number of local craft fairs as well as a few pop-up events, including one at Red’s Mercantile. She currently offers just under 20 varieties of handmade bar soap in a range of scents, including chocolate chip cookie, patchouli and vanilla, and coconut lime verbena. She offers shower steamers in a variety of scents as well as body lotion. She reports she is working on developing an all-natural line and wants to expand her offerings of shower steamers and lotion. She would also like to sell more online, get her products into a local retail store, and teach a class on soap making. To buy some of Maddy’s soap, check out eauclairesoapfactory.com.